-We sipped passionfruit sangrias while trying not to laugh at the overly attentive Fabio-type maitre d'. -We shared sushi and a sampler platter which included a ceviche marinated in coconut milk - yum! -We admired the interior design and chandeliers and brick walls that felt so much like Europe. -We talked about urine therapy, which is quite gross and should probably not be discussed over dinner at a fancy restaurant. we had the best dessert I've ever tasted in the DR! The Volcán de Dulce de Leche. 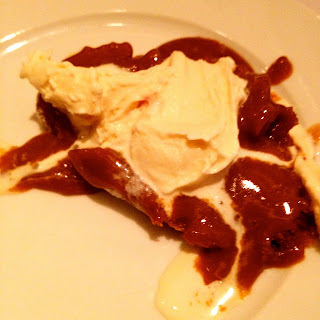 Gooey caramel oozed everywhere and although it looked like a puddle on my plate it was delicious and buttery and the perfect pair for its vanilla ice cream. The place looks amazing and the food looks so so yummy!